Though, in the grand scheme of things, online social networking really isn’t all that old, it’s common to hear complaints about how social isn’t social, that interactions are either impersonal or unpleasant. If you’re in the camp that Internet connections could stand to be more genuine, more natural, more civil – more of whatever you think is currently missing, then you should beeline to join the private beta of Yapply. The ability to have conversations on any page is deceptively brilliant. Instead of falling into the usual traps of linking to content, and then having a rather stale exchange of comments, Yapply lets conversations happen in real-time, without leaving the content of interest. How often do you find yourself coming across something on Facebook that’s already old news? Or how often do you abandon Twitter because you don’t have the patience to sort through your feed, despite knowing there’s sure to be a lot of ideas and chatter worth your time? Yapply gives everyone’s overworked filters a break. You don’t have to hunt down content or discussions. They’re right there in front of you, waiting for you to dive in – a lot like flesh and blood humans talking to one another. For those who find that online relationships always feel a touch fabricated, Yapply is a handy tool to spark up conversations – or jump in on ongoing banter – more naturally. Of course, you can still do all of the other stuff we’ve come to expect of social networking, such as share content or links on familiar social channels, drop your thoughts and opinions, and discover new content. Relax, all that activity is here to stay with us. However, finding people on the same page as you (or bringing people on over) to have conversations is a refreshingly open and direct way to yap online. Less talking at one another and more talking to one another. Bravo! 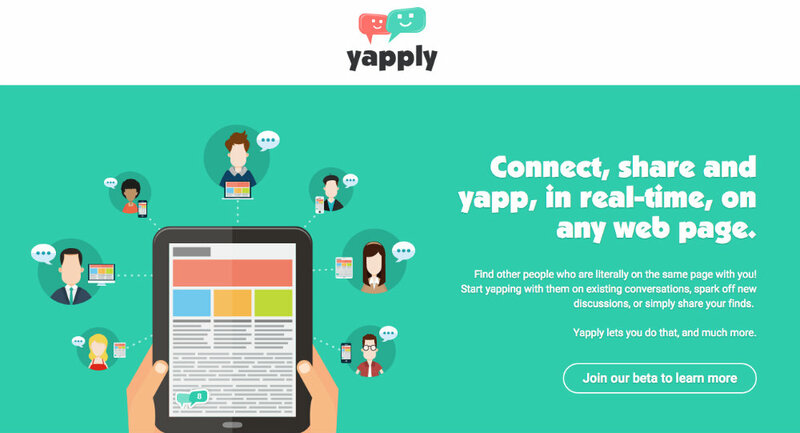 If you’re ready for real-time conversations on any web page where you feel like talking, find out more at yapp.ly.